Aside from aiding your community, upgrading your electrical infrastructure, including your lighting will tremendously improve your company's bottom line. 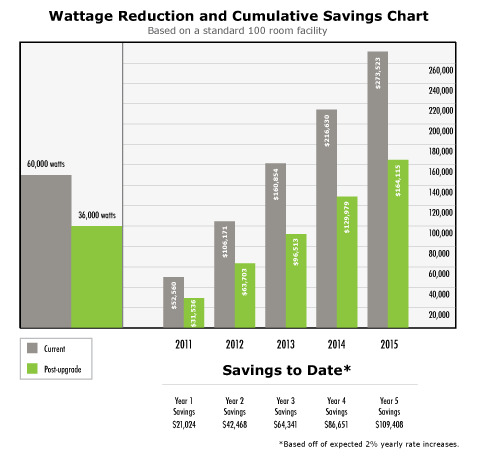 By upgrading your electrical infrastructure, including your lighting; you will see the savings immediately. You will also avoid any potential outages as well as yearly increased costs. These proactive measures will provide your business a certain piece of mind when it comes to cost certainty. Which is as vital to your business as your business itself. Click on chart to view larger scale. Electrical solutions can easily reduce your energy costs a minimum of 50%, while also substantially improving the aesthetics of your lighting system. Electrical Solutions Network also realizes the importance of calculating maintenance and cooling savings, and was always translate that into an easy to understand diagram. The average ROI timeline is as little as 6 months and rarely greater than 3 years. Electrical Solutions only specifies American made products, which in addition to supporting our economy we have found they also have the greatest overall value. Including cost, effiency and reliability. We also specialize in design and specification of upgraded motion sensor and daylight harvesting technology that will greatly reduce your overall consumption. One thing we consistently preach is: "No matter how much you reduce your wattage. It doesn't get any cheaper than OFF!"